Each month, the Basil Hallward Gallery (located upstairs in the Pearl Room) hosts a new art exhibit, as well as dozens of author events featuring acclaimed writers, artists, and thinkers such as Roddy Doyle, Joyce Carol Oates, Michael Chabon, Annie Leibovitz, and President Jimmy Carter. And the City's newest addition (October 2010) is Powell's Books Bldg. 2, a relocation of Powell's Technical Books, brings mathematics, sciences, computing, engineering, construction, and transportation sections closer to visitors at the flagship store. Bldg. 2 is located across the street from the City of Books on the corner of NW 10th and Couch. Every day at our buyers' counter in the Orange Room we purchase thousands of used books from the public. Powell's purchases special collections, libraries, and bookstore inventories as well. 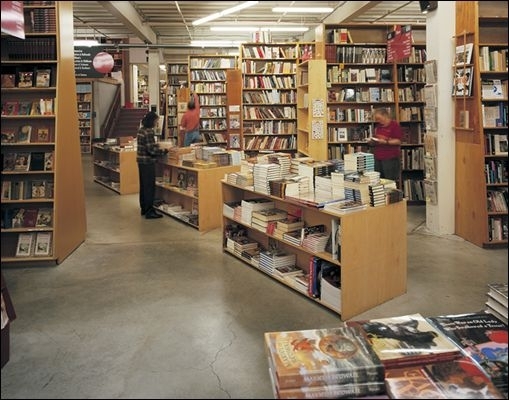 More information on Powell's City of Books. As Irene Adler is THE woman, so Powell's is THE bookstore. This place really is the best bookstore in the world. I visited Seattle and rented a car and drove to Portland for a day just so I could go to Powell's. Great experience. Recently returned from an inspiring family trip to Portland. Great city, great bookstore. This is simply the best bookstore in the world. I visited Portland once and fell in love with Powells; the ultimate second hand book buyers fantasy. It's a bit of a trek from the UK but I would love to go back. More bookshops should be this big and this great. I don't think you can really get it until you've been in a bookstore with more than a million books. It messes with your head. The Mecca of books. Someday I will go to Portland and see the sights, but all my life I've only gone to do a specific event and then to go spend a day at Powells.